But, when we come to the higher speeds of travel, even the well-educated man becomes highly skeptical for no reason at all. Such people in their simplicity constantly forget that, every day in their lives, they themselves are travelling at the rate of 65,000 miles an hour (I refer, of course, to the speed at which the earth circles around the sun.) Yet, not one of these skeptics feels this so-called tremendous speed at all; for the simple reason that speed, like everything else, is relative. When the Wrights flew in their first airplane, it did about 35 miles an hour. Airplanes have actually made 400 miles per hour, up to the present time; and new and higher speeds crowd out former records almost daily. Of course, there must be a limit to the speed of flying in the atmosphere; for at a certain speed, in this dense medium, at sea level or a hundred feet above it, the machine would go up in smoke, because of the tremendous friction created. We have only to look at the night sky and see what happens when a meteor strikes the outer, and much more tenuous, atmosphere at a speed of some seven to ten miles per second. For this reason, the really fast flying of the future must, of course, be done at the higher altitudes. It will be necessary to leave the atmosphere entirely and go above it in velocities proposed here, which are astonishing yet nevertheless, even today, quite practicable. All we require is a rocket flying machine, which makes use, not of propellers, but of the reaction of its exhaust gases to send it forward. Already, many such rocket machines have been constructed; and every day newspapers report new experimental rocket devices which operate cars and airplanes by means of this system of propulsion. Of course, we have not, as yet, a satisfactory and economical rocket engine. The reason is that the art is, as yet too new and not enough research work has been done. This will come later; since developments of this sort must always be gradual. With the present proportions between the weight of the fuel and that of the rest of the flyer, the former is so great that you need over 90% of the available space for fuel, and have left only 10% for cargo. This makes the venture economically unprofitable and, for that reason, no big machine has, as yet, been constructed. There is, of course, another important problem and that is a machine of this kind must be hermetically sealed because it flies above the atmosphere, in a partial vacuum, and the car must be equipped to take along its own oxygen, and its own machinery to renew the air. This problem, however, need not worry us; because submarine engineers already have solved the problem for us in a very efficacious manner. The real problem today is centered in the one wordâ€””Fuel.” Once this has been solved, the flight from Berlin to New York, and vice versa, in one hour or, under certain circumstances, much less, is no longer a dream. As a matter of fact, I am certain that such a flight will be made during the next fifteen years, and perhaps much sooner. LET us see how this flight is going to work out. Our metallic flyer is placed on a metal runway and, after the doors have been hermetically sealed, the passengers are required to lie in hammocks which are supported by heavy springs. The signal for the start is given; with a tremendous roar, the machine leaps into the air, and, as it seems to the spectators, goes almost straight up. However, it actually does no such thing; although the angle is some 60 to 70 degrees. Within thirty seconds the machine has vanished in the upper regions of the atmosphere; through and beyond which it passes into extra-terrestrial space. In the meanwhile, the tremendous acceleration of the flyer during the first few minutes makes things rather uncomfortable for the passengers. Their bodies now seem to weigh tons; and they are pressed with a terrific weight against the hammocks, which give as the springs which support them elongate. The passengers begin to have trouble with their breathing, due to the weight which seems to lie on their chests. It becomes almost impossible to lift an arm, because of the terriffic weight. They become, however, accustomed to this and, as the flight goes on, the weight gets less and less until the time comes when they must actually cling to the hammocks to keep from being bounced against the ceiling. The machine in its flight from Berlin, from the start until almost the finish, uses no wings. It requires none because, the fewer obstacles there are against the atmosphere the less resistance, and the more quickly the machine will leap out of the atmosphere. So, since we wish to get out of the atmosphere into empty space with all possible speed, the wings are folded back or “retracted” into the hull of the machine. By the time the rocket has reached its highest speed, of nearly four miles a second, the fuel allotted for the start has been consumed. The rocket continues to rise, like a great projectile, requiring no further power. It reaches the highest point of its curved path, or trajectory, some 630 miles above the middle of the Atlantic ocean; and then descends in a “free fall” toward its destination, its speed increasing at the same rate that it was reduced by the pull of gravity during the ascent. When the machine is still 150 miles from its destination, the fall is checked. The retractable wings, which had been folded into the hull, for the start, are again extended to full span and they now begin to effectively grip the thin atmosphere. As the machine dives into the denser atmosphere, the wings and body encounter a tremendous resistance and begin to get hot; but the navigator has already turned on the artificial refrigeration to keep the passengers comfortable and, incidentally, to prevent the machine from getting too hot. Again the passengers are pressed with a tremendous force against their hammocks because the machine is now “decelerating;” again the passengers’ bodies become as lead and their breathing is difficult. While the machine was still in the open space, the forward or so-called “retardation” rockets had begun firing in the general direction of New York. It it necessary to do so because, at these high speeds, if the machine were allowed to drop directly into the atmosphere, the heat from the friction of the atmosphere against the hull would become so great that the machine would melt in parts. But the retardation rockets diminish the speed somewhat; so that, when the retractable wings are pushed out, there will be a lessening of the friction, due to the diminished speed. The rocket firing is then shut off, and the machine completes a long and graceful glide to New York; where it settles, perhaps, in New York Bay or some other nearby body of water. The entire flight, from start to finish, has taken less than an hour to cover the distance, as the crow flies, of some 3960 miles! The minimum theoretical time of flight is calculated as only about twenty minutes; but this is not practically possible, because of the tremendous acceleration that would be necessary; which would be too great for a flyer carrying a human crew and passengers. 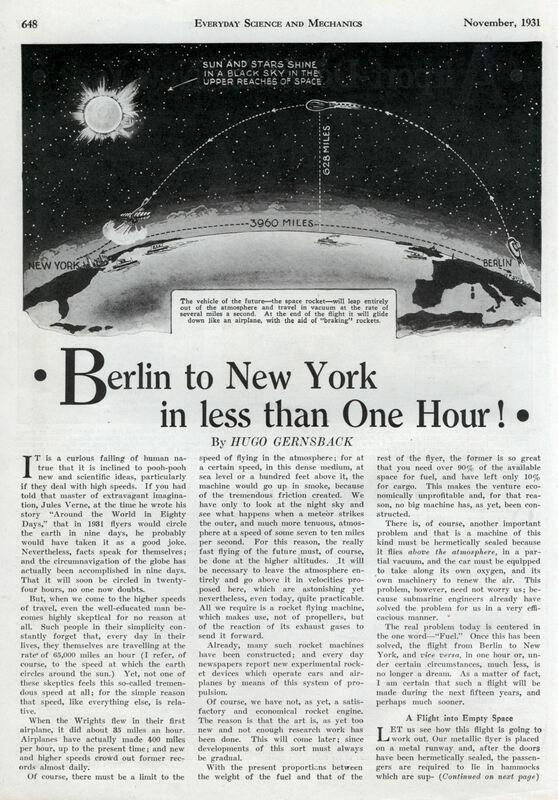 For that reason the ascent through the atmosphere over Berlin, and the downward glide near New York, will actually consume more time than the principal portion of the flight, covered at high speed. If it were possible for human bodies to stand the shock of sudden acceleration to a speed of four miles a second or so, and subsequent rapid deceleration, then the actual flight from Berlin to New York might be made in a time as short as fifteen minutes. For freight or mail only, this high speed may not be impossible. There is not room here to discuss all the details which must enter into the de-sign of a rocket flyer and the technique of its operation. 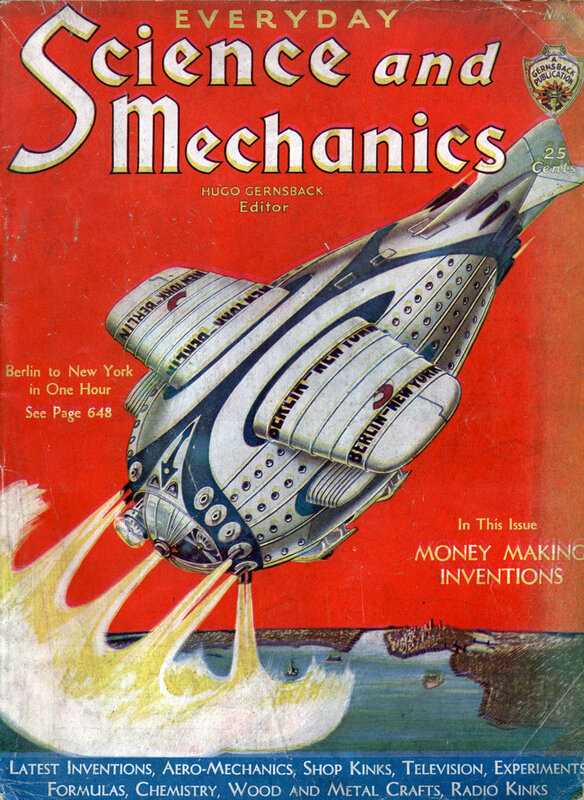 The cover of this issue of Everyday Science and Mechanics is illustrated by a picture of such a flyer, showing its probable general appearance. It must be streamlined, with a “falling drop” shape, to reduce the resistance of the air during its rapid ascent. The wings are then, as we have said, telescoped completely into the hull, from which they are later extended again; mechanism of this type has already been developed for use in present-day airplanes, to meet the conditions of flight at different elevations. The vertical and horizontal fins will serve to steady the flight, in both ascending and descending. For the ascent, the front of the flyer must be enclosed by a perfectly smooth nose; but in descending, as illustrated in the cover picture, the nose will be opened, to present a greater resistance and to allow the functioning of regular airplane propellers, which will give greater certainty of maneuvering. The purpose of the stern rockets, to drive the flyer ahead, and of the bow rockets, to slow it down, have been explained; by firing rockets only on one side or the other, they may be used to correct the course if the flyer is driven from it by winds or otherwise. The flyer must have, of course, landing gear or pontoons; when it rises, it will carry an enormous weight of fuel; but this will be expended in the first few minutes of the flight, and the hull will be extremely light, and float readily. For the immediate future, therefore, we see how a trip from Berlin to New York, across the Atlantic in a single jump, with a passenger-carrying vehicle, is within the bounds of present-day scientific knowledge, and feasible from an engineering standpoint. Hugo Gernsback (August 16, 1884 – August 19, 1967), born Hugo Gernsbacher, was a Luxembourg American inventor, writer and magazine publisher, best remembered for publications that included the first science fiction magazine. His contributions to the genre as publisher were so significant that, along with H.G. Wells and Jules Verne, he is sometimes popularly called “The Father of Science Fiction”; in his honor, the annual Science Fiction Achievement awards are named the “Hugos”. Wasn’t there an article from the 1950s of a NY to LA passenger rocket that ‘skipped’ on the atmosphere after launch?